After graduating from Orchard Park High School in 1963, H. John Markulis centered his interests on fast cars, cold beer, young ladies “and not much else,” he says. At that time, it would have been impossible for him to imagine that he would one day fly a gunship high above Saigon in South Vietnam as helicopters touched down on a rooftop and ferried away the last of the personnel from the U.S. Embassy – a bitter image that capped off a war that had inflamed both doves and hawks back home. Now, with next week’s 40th anniversary of the war’s end – which came to be known as the Fall of Saigon – Markulis is sharing his story, after friends and loved ones convinced him that it should not be lost to time. As a callow 19-year-old whose chief goal was fun, he concluded that the Vietnam War would prove an impediment. So to avoid the draft and what was turning into an unpopular war, he attended the University at Buffalo, securing an educational deferment. Each semester he took the minimum amount of courses to qualify as a full-time student. He managed to stretch out this carefree lifestyle for five years, with a vague notion of continuing it by going on for a doctorate in psychology. But Uncle Sam was having none of that. After Markulis earned his bachelor’s degree, a draft notice arrived from the Army. Yet Markulis still had one final maneuver up his sleeve. He had spent one semester in the Air Force’s ROTC program at UB and looked up his old commander, asking if he might make a recommendation for him to serve in the Air Force. “I knew if I was drafted into the Army, I’d be in Vietnam right away. Some of my friends were already there. The ROTC commander gave me a glowing recommendation, recalling how my test scores qualified me to be an officer and a pilot,” Markulis says. It worked. The local draft board allowed him to enlist in the Air Force. But let’s back up for just a minute. Considering what had happened to Markulis in his late teens, he might have gotten an inkling that he was predestined to be a flier. “I was driving 90 miles an hour in Orchard Park and I went over railroad tracks and went airborne. A police officer stopped me and asked to see my ‘pilot’s license,’ ” Markulis happily recalled. In the Air Force, he felt as though he had come home, realizing that it had been “immature thinking” that had delayed him from beginning a career that would last 27 years and would have gone even longer, if not for personal tragedies. 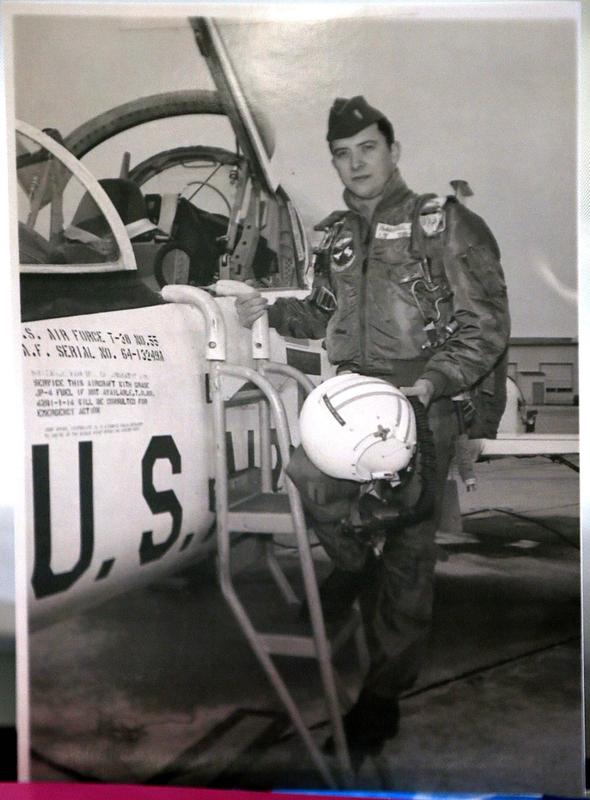 His first job as pilot took him into the eyes of hurricanes as a member of the 53rd Weather Reconnaissance Squadron. “We called ourselves hurricane hunters,” Markulis says. Stationed in Puerto Rico and later Mississippi, Markulis negotiated the swirling winds and rains in his four-engine turboprop WC-130 to reach the placid center of the storms so that his crew could transmit information on the intensity and likely direction of the beastly weather. “The various planes I flew were struck on several occasions with lightning,” he says. After four years of battling the weather, he went to war. He served in Vietnam for what turned out to be the final year of the war, 1974-75. But it is the last day of the war, April 30, 1975, that sticks with him. Markulis flew his four-engine AC-130 Spectre gunship, with a crew of 13, thousands of feet above, providing cover as American embassy personnel climbed onto a Saigon rooftop and into U.S. helicopters that ferried them to safety on Navy ships. His concern, Markulis explained, was for the final contingent of Marines who were under orders to evacuate by land once everyone was off the rooftop. Markulis says other pilots and Americans made the same urgent request. But before he could confirm whether it was granted, his plane ran low on fuel and he had to fly back to his base in Thailand. For Markulis and his crew, there was extreme relief. The war was over, but the last battle was yet to be fought. It occurred two weeks later – May 15, 1975 – a couple days after Cambodian troops had seized the SS Mayaguez, a U.S. merchant ship, and its crew off the island of Koh Tang in the Gulf of Thailand. Markulis’ plane was part of a massive aerial blockade providing protection for Marines who had gone in to recover the ship and its crew. That is one decision Markulis says he has never regretted. After the war, he continued to serve in the Air Force advancing in rank and responsibility, but that ended in 1995 when his wife and father both became ill. He gave up the chance for promotion to brigadier general, instead choosing to retire and care for his loved ones, among them his two young children. Two years later, within months of each other, his wife and dad died. “I was raising a 4-year-old daughter and an 8-year-old son up here in Hamburg,” he says. Those were the hardest years of his life, but three years later in 2000 he says he was blessed to meet a wonderful woman, Cathlene Krawczyk, from Lancaster.